"Buffalo’s newest and biggest movie palace, the Lafayette Square theater, will open this evening. Indications are that it will be filled to capacity. Workman today were busy putting the final touches on this luxurious temple for the entertainment of the public. A special program will be offered tonight. 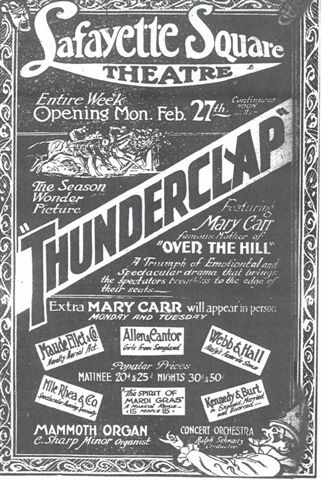 Mary Carr, famous as the film star who played the endearing role of the mother in “Over the Hill,” will be seen in person. Several movie magnates are also scheduled to be present. 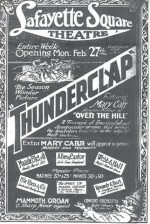 The picture features of the program will be “Thunderclap” in which Mary Carr is the star. This is described as an emotional and spectacular drama. There will also be half a dozen vaudeville acts which will show theatergoers the kind of policy on which the playhouse will be operated in the future. Buffalonians will have opportunity of hearing for the first time C. Sharpe Minor, as organist of widespread reputation on the Pacific coast, who has been brought to this city under contract to play. He will give a recital on the Wurlitzer Hope-Jones Organ, said to be one of the most remarkable pipe organs ever constructed. The concert orchestra under the direction of Ralph Schwartz will present a special program. The theatre seats 4200 and is designed to provide all the latest appliances for the comfort and convenience of patrons. The general color scheme throughout is gray, with pleasing combinations of buffs and rose. Handsome mural paintings adorn the walls. The ceiling is finished in a dome effect with rich ornamental work and decorations, and from it are suspended five magnificent crystal chandeliers. "After two centuries of experience, five generations of skilled craftsmen, all equally intent on making and improving instruments, are behind the achievements of the Rudolph Wurlitzer Company of today. An excellent instrument, a finished product of the Wurlitzer Company has been installed in the new Lafayette Square Theater, which opens to the public on Monday evening. Management of the new Lafayette Square Theater has purchased a Wurlitzer Hope-Jones Unit organ. It excels in volume, variety, and delicacy of tone color. The ponderous tones of the might diaphones and the tubas, while capable of producing thunderous volume, can be reduced in power by means of the swell shades, so as to accompany human voice. Fathers, sons and grandsons of the Wurlitzer house have devoted their lives in producing an instrument that stands the test, an instrument that has won fame through the centuries. The Wurlitzer organ can be called a home product as it is manufactured in North Tonawanda. The greatest of all creations, the type of organ that was installed in the new Lafayette is made in North Tonawanda. Music in the home is an investment in happiness. To promulgate this idea the Rudolph Wurlitzer Company is aiming to make some kind of musical instrument that can be found in every home. 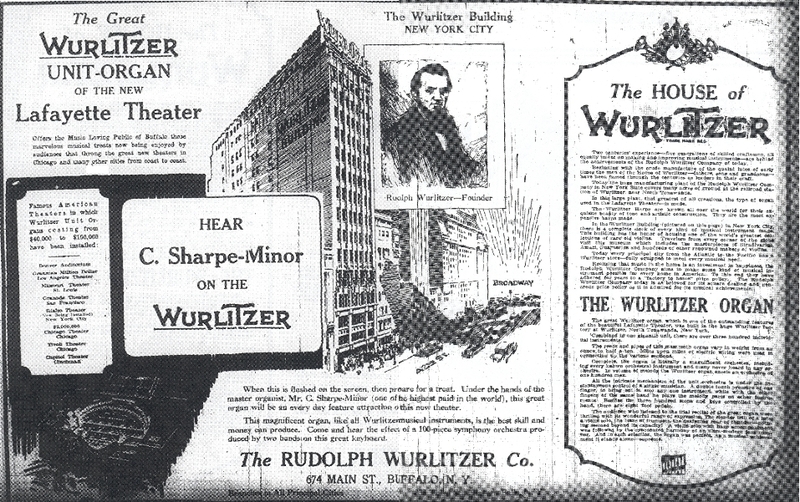 The generous price policy, square and fair business methods have won admiration for the Rudolph Wurlitzer Company. The tone quality of the Wurlitzer hope-Jones unit organ is so majestic and refined that it thrills the listened and holds him spellbound in wonder and amusement at the wealth of tone color furnished. The delicate strings are the nearest approach to the violin yet accomplished and are superbly rich in tone quality. The flutes, clarinets, oboes are realistic imitations of these instruments, while the diapasons furnish the rich deep and sonorous tone which forms the backbone of the king of instruments. The mighty tubas and diaphones are a revelation in the art of organ voicing, furnishing a wealth of tone color which can only be realized by listening to them. In addition, there are a number of new tone colors only to be found in the Wurlitzer Hope-Jones instruments, which greatly add to the variety of tone usually in the organs. The whole instrument, with the exception of the 32 feet pedal diaphones and piano, in enclosed in two specially built chambers so that every stop is capable of expression at the will of the performer. To try and convey to the listener the vastness of the size of the large 32-foot diaphone, CCCC pipe is 34 inches square at the large end, tapering down to a 6-inch square, and is 32 feet in length. In contrast to this, the speaking length of the smallest pipe in the organ is about ¾ inch and of the diameter of a straw, and weighs but 1-2 ounce. In addition to the grand and dignified tones associated with the pipe organ, this instrument contains a great many percussion effects, such as: Harps, chimes, xylophones, glockenspiels, vibrating bells, sleigh bells and drums. It reproduces in a lifelike manner the symphony orchestra with a pipe organ. The wind pressure employed ranges from 6 to 18 inches. The use of heavy wind pressures and up-to-date methods of voicing produce quality and volume of tone absolutely impossible of production by the ordinary means. The Wurlitzer Hope-Jones electro-automatic action is absolutely reliable as it has stood the test of time, having been in use over 20 years. The touch of the instrument is lighter than that of a piano, and no matter how much or how little the organ is used, the touch remains uniform. It is capable of repetition far quicker than any performer can execute. This is fitted to the accompaniment, great, and bombarde organs and is a wonderful help to the player as it enables him to bring out any particular part or solo without raising his hands from the keys. The second touch is also fitted to the pedal organ for use in connection with the drums. For sforzando effect, this device is most useful. This unique attachment is fitted to tow keyboards and pedal, with wonderful results. Such effects as a violinist plucking the strings of his violin are possible by means of this addition. Three of the keyboards are fitted with this device, which enables the player to have a suitable bass arrangement for him at all times, and under all conditions. By depressing a tablet, which is placed under each keyboard, a suitable bass is automatically provided to whatever stops are drawn on the manuals, and by a further depression of the tablet, the mechanism is what is termed “locked” and as the stops or combinations are altered, the bass stops or combinations, automatically alter to suit. Playable from and attached to the organ console by means of an electric cable so that the organist can play piano from the console with as expression as if he were seated at the piano itself. This is accomplished by means of the different key touches in conjunction with special expression devices and the result achieved is a revelation. The expression obtainable though the medium of the swell shades fitted our patented sound trap joint is truly remarkable, and cannot be equaled by any other form of swell shades. 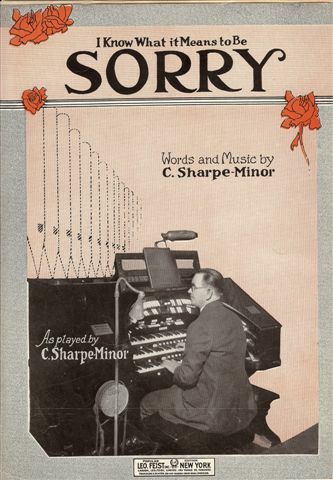 The picture below shows the organist C. Sharpe-Minor seated at an unidentified 3-manual WurliTzer console that was pictured on the sheet music cover of "I Know What It Means To Be Sorry" which was written by Sharpe-Minor and copyrighted in 1923. Mr. Sharpe-Minor was the first organist to play Opus 501 at the Lafayette Theatre in 1922, and he remained associated with the theatre until 1927. We carefully compared the sheet music picture with a picture that we have of Opus 501 that was taken in the 1950's when the organ was still in the Lafayette, and the configuration of all of the visible stop tablets on the stop rails and fallboard on both photos match (i.e., white, red, and yellow tabs are in the same places and spacing is identical). Although we'll probably never be certain, we believe that the console shown on the sheet music is Opus 501. (The photo of the sheet music was generously provided by Jeff Weiler and is from his collection.) We would appreciate receiving any information that could either add validity to or disprove our theory.